The immediacy of impact the opening of the China Trade had upon the world’s markets is unparalleled. Europeans and Americans alike soon clamored for the spices and silks introduced by the sailing merchants. Western fortunes were built upon the success of the booming demand. Of all the items, the most desirable today are the paintings which depict the important Chinese harbors and the ships which visited them throughout the 19th century. The earliest examples of these works were of the harbors of Canton and Macao in the late eighteenth century. 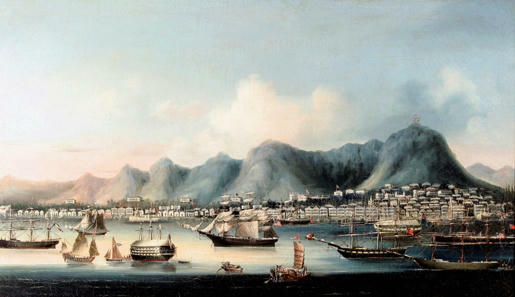 The first views of Hong Kong, such as this example, began to appear early in the 19th century. As Hong Kong grew in stature as a British crown colony, these paintings became an important record of the development of the port and the increasing volume of international shipping that called there. This example uniquely shows several ships with sails up, including an American clipper in the heart of the port. Three British ensigns are visible to the right with another American at anchor, while a variety of other European flags are visible to the left and on the headland buildings. The signal tower is in place atop Victoria Peak, and the larger estates rise on the peak’s lower foothill elevations. This painting is complete with colorful hues in the sky and a sense of the fading light from the sun traveling beyond across the Chinese mainland, headed like this painting, for Western lands. Beginning in the late 1700s, an increasing number of international merchant vessels began bringing back to their respective ports cargos of exotic objects from China which found ready markets in America and Europe. An insatiable interest in things oriental resulted in a range of exquisite objects created by Chinese artisans specifically for the western markets. Among the items that filled the holds of the sailing ships were furniture, silk embroideries, lacquerware, ivory carvings, fans, and a fascinating variety of paintings. These paintings offered first hand documentation of the ships that plied the Far East Trade and the exotic ports they visited. These early ‘China Trade’ paintings are considered to be some of the finest harbor views and ship portraits ever produced. They usually have no signatures or labels and offer little or no indication of who the artist was. Only a score or so names from the period are even known and these may be positively identified with only a very few paintings.